Large commercial trucks are a necessity for American commerce. Unfortunately, in the case of an accident, these trucks can pose a huge threat to all other motorists. Truck accident victims often suffer devastating injuries, which means it is often necessary for victims to work with a Long Beach truck accident lawyer in order to recover the compensation they deserve for injury-related losses. When you need this kind of expertise, don’t hesitate to call Jamal Injury Law P.C. Driver error — fatigued driving, distracted driving, driving under the influence of drugs or alcohol, violation of traffic laws, violation of FMCSA regulations, driving without a valid license, not taking proper precautions in adverse weather or other possibly hazardous driving conditions, and more. Truck company error — hiring inexperienced or unqualified drivers, failing to properly inspect and maintain trucks, failing to adequately supervise drivers or discipline them for FMCSA violations, or not performing the random drug and alcohol testing on drivers that is required by law. Cargo loading company — overloading a truck trailer, not properly balancing or securing cargo in a trailer, not having the proper training to load liquid cargo or hazardous materials. Due to these complexities, working with a truck accident lawyer who is experienced in helping Long Beach residents can be incredibly important. By working with a local lawyer who is familiar with these types of cases, you will know that you are receiving the most knowledgeable and specific legal advice possible. Our years of experience at Jamal Injury Law P.C. have shown that determining which party is liable in a truck accident can be difficult. If the truck driver did not make an obvious error, identifying the true party at fault will likely require the use of experts to investigate all of the circumstances surrounding your accident, including the type and location of the property damage and the types of injuries sustained. It is common for more than one party to be held liable for any single accident. For example, if the driver acted negligently, the trucking company who employs that driver may often also be held responsible. Whether your accident happened locally or you live in the area, you should always make sure you work with a Long Beach truck accident attorney to bring claims against all responsible parties, as failing to do so may lead to you missing out on substantial compensation. Truck accident cases can also be challenging because truck companies can be difficult adversaries. Truck companies are aware that they operate in a high-risk industry and that there is a high probability they will face a lawsuit for accidents and injuries at one time or another. For this reason, these companies have legal teams and insurance companies on their side to help limit the amount they must pay out to accident victims or to help them avoid liability altogether. It is imperative that you seek representation from a capable personal injury attorney who can stand up for your rights. 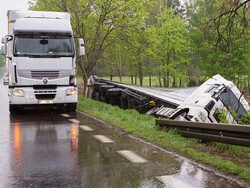 If you have suffered injury in a commercial truck accident, you should immediately connect with a truck accident attorney serving Long Beach. Attorney Suliman Jamal knows how to help truck accident victims receive the full and fair compensation they deserve for their losses. Contact Jamal Injury Law P.C.’s office today to schedule your free consultation and to discuss a possible case.